The safest way to survive and prosper in such an environment is to join with everyone else in playing the system. Davis tells the story of Tony Dye. A top analyst and fund manager, Dye foresaw the dot‐com bubble of 2000, but “too early”. The value of his holdings did not rise with the market when others did. He was fired. When the crash occurred, they lost massively and he was vindicated. Did they laud his foresight and re‐hire him or offer some compensation? Hell no, for that would have meant they'd have had to fire themselves for screwing up. The moral drawn by his colleagues was to play it safe and get it wrong like everyone else. Davis's gripping account reveals a country and an economy led by lemmings taking the wider public with them over the cliff edge. After twenty years of interrogating the managers and politicians of the UK, he finds their leadership to be “solitary, rich, nasty, brutish and short” when it could and should be “connected, modestly paid, nice, civilised and long”. He provides a two‐page list of reforms that might help. 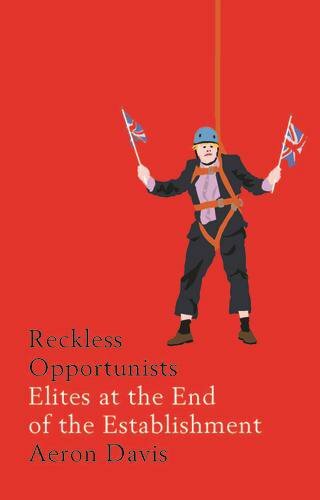 Reckless Opportunists has changed my mind on how Britain is governed. But its overall grasp of why it has become the way he describes is uncertain. The book provides the ingredients for a new analysis of Britain's Lords of Misrule, though they are still undercooked and await a historical theorisation. Davis starts Reckless Opportunists with a generous reference to The Establishment: And how they get away with it, by Owen Jones and to Robert Peston's Who Runs Britain?. Both texts are recent, justified diatribes against the extreme inequality being generated by the UK's current arrangements. But neither has any sense of postwar history. Jones is a wonderful polemicist and interviewer, but he simply presumes the existence of a coherent ruling elite that he then assaults. Peston does not go even that far. He uses no concepts at all and does not answer the question posed in his catchy title: Who Runs Britain?. In the 1950s and ‘60s, ‘The Establishment’, as mapped by Anthony Sampson and others, was almost exclusively white, male, public school, Oxbridge and did run the country. Today, this order has been overturned. Bi‐partisan policies of neoliberalism have undermined public service and hollowed out the support essential to ensure a well‐governed society. Davis illustrates how the City is now driven by rough-necked outsiders alongside public schoolboys in hock to ‘greed and ruthless self‐interest’. The result is an unstable, disunited system far more extensive than the financial sector alone. He observes, “self‐interest and competition has left politicians willing to destroy their parties, civil servants their departments, chief executives their companies, and journalists their publications”. The downfall of the system began with the triumph of late Thatcherism and the reforms of Blair. First, there was Thatcher's confinement of the trade unions and the Big Bang deregulation of the City as well as the full‐scale privatisations of the 1980s. An expanded public sector followed under New Labour but it was crucified by demands for simulated ‘competition’, targets, outsourcing and internal markets. Davis's systematic account convinces me that it is simply wrong to assume that there is any longer a unifying, governing interest at work across the political, financial, commercial and industrial systems of government in the UK. It is not that ‘The Establishment’ is failing. There isn’t an ‘Establishment’. The individuals involved may be connected in the way of all elites – collaborating as well as competing in the short term. But what he shows with unrivalled detail is that there is no longer an economic ruling order consciously united by a shared view of a larger British interest.